Project Cartographer v0.4.0.4 Build Time: Mar 22 2018 15:39:28. 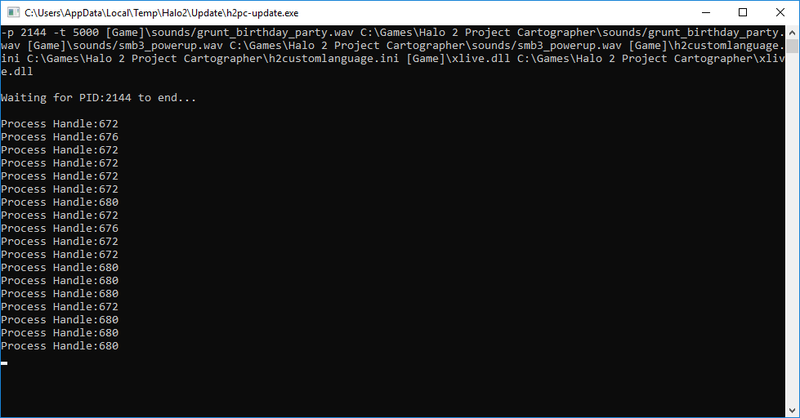 The next time you launch Halo 2 Vista with Project Cartographer, you will be prompted to download and install a new update. Here is a video demonstrating how to update your game (very simple, you just click along with it). Multi-threaded the login process to not freeze the game. Cheaters now can only play for 30 minutes and they have annoying countdown timers bouncing around the screen (punishment). Insufficient Serial computers are allowed to login and play in the cheater network only unlike before where they couldn't play at all and had to contact an admin for assistance. Fixed auto selecting last used account. Fixed updating the accounts menu if there the username being added is called the same but has a different ending. On outdated versions, dedicated servers will no longer crash. There has been known issues with some backend stuff causing false cheating bans. However if you have played, and hacked before you could be legitimately banned. I'll have someone check on this. thanks for your reply, I had previously played but offline and I'm just trying to play online, and this error shows me, so I can not do anything to fix it for now? Ever since I downloaded the update, I haven't been able to join any games. you know how to make this? there is any tutorial in the web? i have a problem with the last update, i can't play on several servers, only five i guess, but on i can on private parties. Perdon. Pero todo va bien excepto a que la descargas de mapa ya no va.
Hi, so ever since the previous update(March twenty second), I have been unable to login thanks to this. Would someone please help? I want to update, but can't presumably thanks to this. I have tried running as admin, and I doubt a proxy or firewall would be blocking connection once an update hit.